The OXO brand has been in the market for years now. Known for its hardwearing plastic and metal kitchen gadgets, the company has recently probed into the territory of electronic appliances with their new line christened “Oxo On.” While this new line initially features three gadgets for coffee, this review will only look at the OXO On Barista Brain 9-Cup Coffee Maker, also called the OXO On 9 Cup Coffee Maker. While most multifunction kitchen appliances skew towards gimmickry, this multitalented new coffee maker from OXO not only makes brilliant coffee, but it also offers a remarkable range of brewing and water heating options that you will actually love. What the OXO On 9 Cup coffee brewer can boast of is the Specialty Coffee Association of America (SCAA) certification. This nonprofit group develops standards for coffee makers and offers certifications only to models that meet their standards. Let’s take a look at why this is a brewer that must be taken seriously. You can also watch a demo of its use at the end. 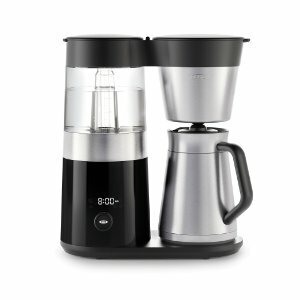 Designed to emulate the pour-over technique of brewing, the OXO On 9 Cup Coffee Maker takes a lot of cues from the Specialty Coffee Industry while still keeping the end user in mind. Standing 15.2 inches tall, and spanning 14.2 inches wide, and 7.5 inches deep, this coffee maker model is unquestionably massive even when weighed against other giant-sized coffee brewers available in the market today. The coffee maker is highly functional and appealingly designed. For instance, the product’s sleek stainless steel and black plastic finish gives the coffee maker a unique contemporary look that blends flawlessly with your kitchen décor. This means that the OXO On 9 is not just any other coffee maker that you have to put away between uses to keep the kitchen countertop tidy and stylish. In addition, to its credit, the machine’s footprint is designed to take up less countertop space as possible. The coffee maker comes with Single Serve Capabilities that allows it to brew as little as 2 – 5oz cups. This feature allows convenient brewing of just enough coffee and is quite useful when you have to brew expensive coffees that are considered more of self-gratifying treats than morning fuel. Since precise water temperature control over the brewing cycle is a compulsory requirement by the SCAA in order for the coffee to reach good taste, the brewer is designed to brew coffee at temperatures between the ranges of 197 to 205 degrees Fahrenheit. This temperature integrity allows maximum extraction of all the desired coffee elements that include sweetness, body, and acidity without giving out the more bitter flavors. Most coffee aficionados will tell you that the slow but steady exposure of heated water brings out the whole aroma and flavor profiles of coffee. This process which is commonly known as the pour-over brewing method is time consuming and therefore not practical for someone who wants to brew up a quick cup of coffee. Surprisingly, this coffee maker pools all that in one machine, giving you an automatic drip style with a replicated manual pour-over brewing method. An Intelligent Microprocessor referred to as the “Barista’s Brain” monitors and controls the brewing cycle and replicates manual pour-over brewing. When needed, the “Brain” makes slight adjustments right through the brewing process to maintain the temperatures at an optimal level. The model also features an LED Interface that is easy to use with intuitive controls. With just a smooth turn of a knob, you change the brew quantity from 2-4 cups or 5-9 cups at a time. With the push of single button, you confirm your selection. Once you have programmed the desired number of cups, the machine takes care of the rest. The temperature and the period of brewing are set automatically to give the best results. This ensures that guesswork is eliminated, so you end up with an excellent cup of coffee. The device also comes with a programmable auto-start that ensures that you get a fresh pot of joe first thing in the morning. The “truncated cone” shaped brew basket ensures full flavor extraction from your ground coffee beans. Therefore, your coffee is squarely robust regardless of whether you brew one or nine mugs at a time. As a standard feature, OXO includes a 1-cup coffee scoop and 10 #4 sized filters that are easy to get in most places that vend coffee. Another additional feature of the OXO On 9 is the wide rainmaker showerhead that is designed to allow perfect saturation of all coffee grounds for a perfect flavor extraction. The showerhead releases water into the brew basket in phases. At the beginning of each phase, the model kicks off a bloom or a pre-infusion cycle. This limited time cycle initiates the release of carbon dioxide in fresh coffee beans as well as support flavor extraction, activating a distinctive blend of notes available in the beans. The Oxo Barista Brain 9 also comes with a detachable Internal Mixing Tube in the thermal carafe that mixes the coffee as it drips. This tube allows every ounce of the freshly brewed coffee to taste. Unfortunately, this particular OXO model does not come with a hot water kettle mode that’s present in the 12 cup model. However, it does come with a vacuum-insulated carafe with brew through lid. Although a thermal carafe is not an entirely fresh concept, it is one of the best ways to keep your coffee fresh and hot. With all these features, the OXO On 9 Cup coffee maker makes an amazing coffee brewer. Most parts of this device including the showerhead and the mixing tube are removable and dishwater safe. All its materials are BPA free to ensure that your cup of joe does not end up being contaminated with potentially toxic elements found in plastic. The brewing consistency of the OXO is unmatched. The grinds are evenly saturated to ensure quality brewing. The OXO is so quiet during operation that all you hear is a peaceful silent ripple at the end of the brewing. The OXO has one button/ knob for all functions. This makes it easy to use except when you have to programme the auto start. It features a sturdy, high quality construction with a sleek design. The internal microprocessor oversees the temperature, duration and the water capacity. Its tall design makes it a poor fit in most kitchen cabinets. It takes a longer time to brew because of the numerous brew cycles involved. While its plastic components are non-toxic and durably crafted, some people feel that the plastic can vary the taste of the coffee. The coffee in the carafe cools after two hours. It has no metric measures.